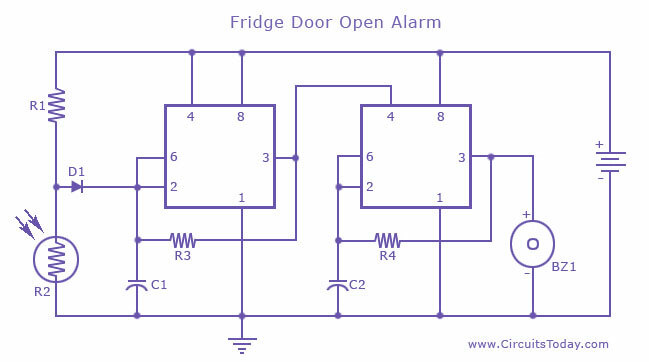 A fridge door open alarm circuit is explained with its detailed working and circuit. The objective of this circuit is to produce an audible alarm when fridge is left open for more than a preset time. This versatile door alarm is made possible with the use of two 555 timer IC’s. Both the 555 ICs are wired as Astable Multivibrators. AÂ Light Dependent Resistor (LDR)Â is used as the light sensor for this circuit. It is basically a light sensitive device that works on the principle of photo-conductivity. An LDR is made of semi-conductors with high resistance. When light falls on the device, the output of the LDR varies, and this output can be used to buzz an alarm for the door open circuit. It is connected in parallel to the timing capacitor C1 of 555 timer, IC1. In the door alarm circuit below, R2 represents the LDR. When the door is completely closed there will be no light inside the fridge andÂ thus the LDR offers high resistance and keeps the resistor R1 fully charged. When theÂ door is left open, the lamp inside the fridge will keep glowing, and thus LDR will be illuminated, and its resistance falls. This makes the capacitor C1 to stop charging and starts to discharge. In simple words, this is because at low resistance LDR by passes much of the current in the parallel path and capacitor gets less current. Now IC 1 starts slightly oscillating and after a preset time of 25 (time T1) seconds its output goes high. This output makes the 555 timer IC2 to produce oscillations and results in a beeping sound for the next 20 (time T2) seconds and this cycle is repeated until the door is closed. Assemble the circuit on a good quality PCB. Time T1 & T2 can be adjusted by varying the values of C1, C2, R1, R4 and so on (Refer the data sheet of 555). Keep in mind that LDR will produce efficient output only if it is placed close enough to the lamp inside the fridge. Fridge Door Alarm Circuit Diagram. The door open alarm circuit can be considered as a hobby circuitÂ for beginners. The circuit can also be used to avoid wasting electricity by unnecessarily keeping the fridge door open for a long time. what are the specifications of R2???? i mean i nw its a ldr bt what are its specificaton…. i tried this but its not working…could the circuit be wrong? i have constructed this project on zero board and chekced all connections but used 22uf as 10uf was not available with me. circuit produces a very little sound and not a BEEP! no affect observed when LDR is brought to dark or light, pl help in finding error. i also want to know, why a high value R3 (2.2M) and R4 (1M) are used, is it the reason?? Hi Mick Thanks. we can sense the light comming through the door or the cold air comming out from the fridge for more than a specific duration or a sensitive proximity switch etc. Please share your ideas also by sending your circuits to Admn Circuits today. Awiating your ideas on Electronics today. once again thanking you for your interest in this forum. very interesting, but i can do it another way to this. Hi, do you know how we can change the values of resistors and capacitors to set our own initial time before the alarm goes off? an equation or something? thanks.